Relying on nature to provide food wasn't sustainable, so Emperor Yan took his people on a quest. Humans often suffered food shortages as they lived purely on what was provided in nature. With magic seeds brought by a golden phoenix, Emperor Yan, a legendary tribe leader in ancient China, guided the Chinese to plant for a more steady harvest. As the emperor and his followers were inspecting the life of his people one winter morning, he saw women looking for food in the snow, men arguing over a dead deer, young and the old shivering in the wind. Though some elderly folk questioned whether it would be against the will of Heaven, Yan convinced the people that it was the will of Heaven that enabled humans to learn from nature and strive to become stronger. The emperor led his people across mountains and rivers, looking for fine seeds. As his people rested at a mountain, a golden phoenix flew over, hovering slowly in the sky. With a sound it made piercing the clouds, a grain with nine ears dropped from the phoenix’s beak. Everybody looked up with their arms extending to the sky. People cheered when Emperor Yan held up the grain. As the grain floated down, the corns separated from it, shining like golden sand, and sprinkled on the land in the distance. People ran to the land and witnessed grains growing rougher and bigger. A young man pulled some and shouted in excitement. People started to farm. They burned the weeds and dead wood on the ground. Men cut down trees with stone axes. Women dug holes with sticks, and then planted seeds inside. In no time, people found that ripping and weeding helped crops grow better. They used sharp sticks as tools first, yet found they dulled easily. Shennong tried covering a stick with a sharp and hollow animal horn, which made a new tool to dig in the earth. This original farm tool was named lei. Another farm tool named si, in the form of a spade, was also invented to shovel and ditch. 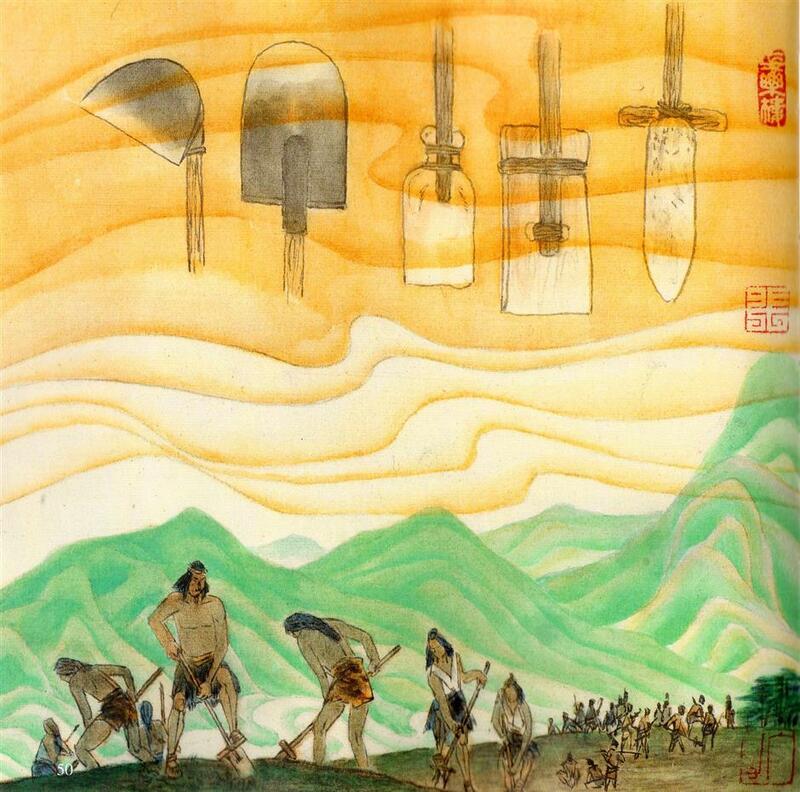 More tools were later developed with Shennong’s help, including various elementary forms of rake, plough and hoe. Farm tools made of wood or stone, such as lei and si, were invented to shovel, hoe and ditch. With the tools, people get better harvests over the years. Yet, the other spring, just as they were ready to sow, people found their seeds had been eaten by borers. Shennong picked up a rare surviving handful of seeds and found them smelling like horse urine. Recalling that few borers were found in the barns, Shennong believed that horse urine could help protect the seeds from borers. He soaked all the seeds in horse urine and found hardly any eaten by borers while sprouting fast in the spring. 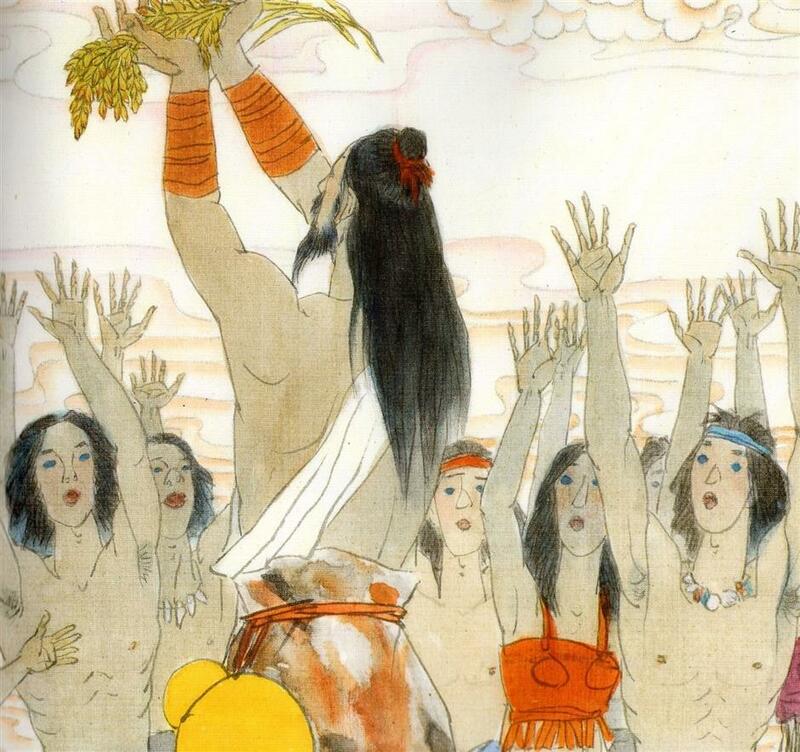 Shennong and his subordinates ran all over the nation, searching for suitable crops to plant. 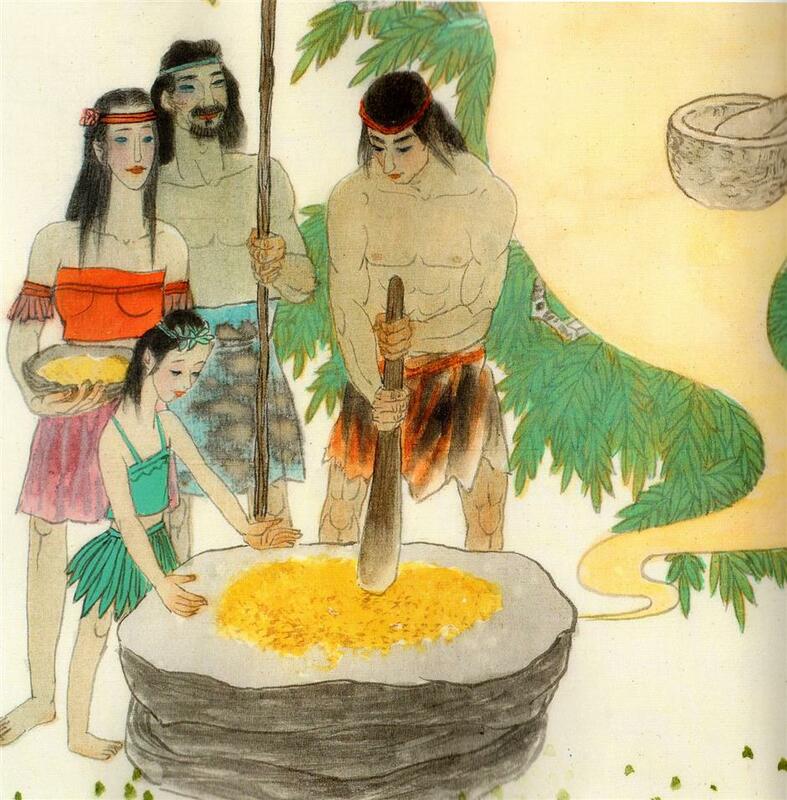 They selected beans, wheat, millet, sorghum and rice as “the five cereals” for Chinese, which were easy to grow and could be cooked into different kinds of food. Chiyi, an assistant to Shennong, was a smart man. He put the grains on the stone, grounding and removing the hulls with a wood stick, as the husks were difficult to digest. 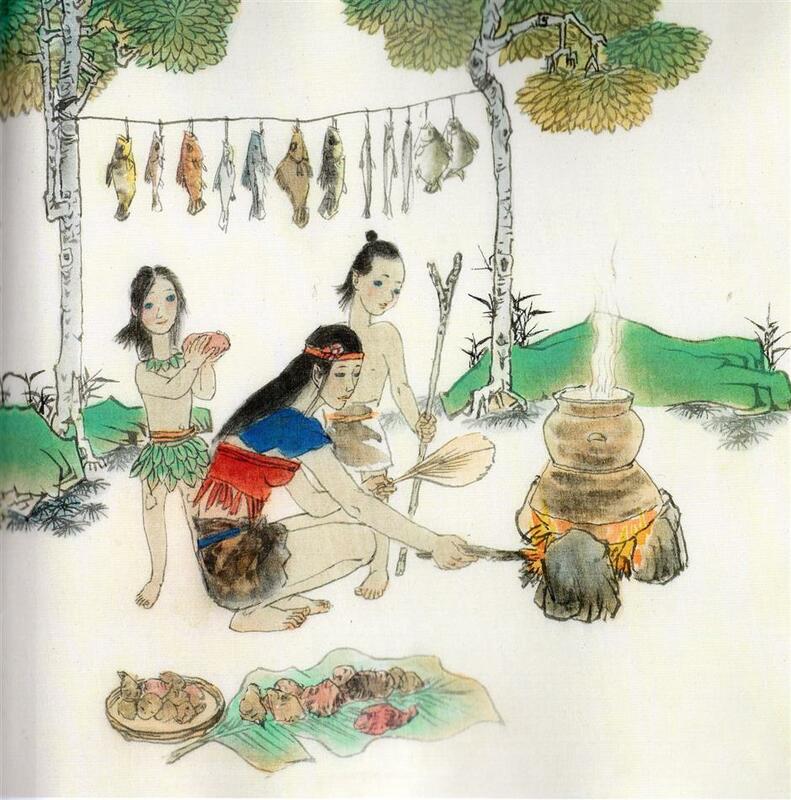 Thus he made the earliest chujiu (pestle and mortar). He also discovered that earth could get very hard after burning, which inspired him to create pottery. Round pottery jars were widely used to boil water and cook congee with grain in it. People used a wooden stick to ground and remove the rice hulls on the stone. The stick and stone were the earliest form of chujiu (pestle and mortar). People steamed rice in a clay pottery named zeng over a jar with boiling water. Chiyi also tried digging some holes under the pottery. He put some peeled grains in it, and then put it on another jar with boiling water. The steam heated the grains in the upper jar and got it cooked. This kind of pottery was named zeng (rice steamer). The cooking method named zheng (steaming) is still widely used in Chinese cuisine today. It is estimated that the population grew quickly in the time of Shennong, which triggered people’s shifting from fruit collecting and animal hunting to crop planting and animal husbandry. Planting crops and taming animals, as well as inventing farm tools and becoming familiar with the farming seasons are all essential to change how humans lived. And that could not be completed in a short time. Some scholars think it may be more suitable to identify Shennong as an age when the Chinese made their way to the agrarian society with their wisdom, rather than a single legendary leader who did all the work.